Larne FC’s Parisian striker Guillaume Keke has spoken of his relief after his sister narrowly avoided last weekend’s Paris terrorist attacks. Keke, who is on loan from Cliftonville, told the Times how his sister Kalo had been in Place de la Republique, near the Bataclan concert venue, shortly before gunmen opened fire on Friday night. At the time of going to print, at least 132 people had died and hundreds were still in intensive care after seven coordinated attacks in restaurants, bars and at a concert venue across the French capital. After hearing about the events unfolding in his home city, where his family still live, Guillaume told the Times that he had frantically tried to contact relatives to ensure their safety. “It was hard and I was scared, as I wasn’t there and I know a lot of people in Paris,” he revealed. “My sister Kalo had been in Place de la Republique just before it was attacked. “She wasn’t at the Bataclan concert venue, she was seeing a friend and had then gone down into the subway. “When the shots were fired she was one station away. “She heard the noise of gunshots and was really scared. “My parents, three sisters and other family members are over there, so it was hard for me as there was nothing I could do from over here. I could only watch as it unfolded. The attacks on Friday night began just after 9.20pm local time, with two explosions close to the Stade de France. This was followed by a separate group of gunmen opening fire on diners at the Petit Cambodge Cambodian restaurant and the Le Carillon bar, killing 15 people. The next attack occurred at the Casa Nostra pizzeria, where at least five people were killed by gunmen. This was followed by a shooting at La Belle Equipe bar, which claimed at least 19 lives. The bloodiest attack took place at the Bataclan concert venue in Boulevard Voltaire, where at least 89 people died after gunmen interrupted a performance of US rock group Eagles of Death Metal. Terrorist group ISIS has claimed responsibility for the attacks, saying it targeted France because of its role in the coalition carrying out airstrikes in Syria. Guillaume says he was “horrified” at the loss of innocent life during the Paris atrocity but has received support from his team-mates, Manager Davy McAlinden and Larne Football Club fans. “When my team-mates heard they texted me, as did the coach, and I have had messages from the team’s supporters,” he said. While many French citizens have vowed not to let the attacks undermine the country’s core value of liberty, Guillaume says that he fears further attacks in the future. “I think they are not finished and we have to stand up and stand together against this and try to do something to finish this war,” he continued. “We don’t want more people to die and get hurt. Meanwhile, books of condolence have been opened across the borough to show support for the victims of the Paris attacks. Mayor of Mid and East Antrim Billy Ashe said that the move would help local people to show “solidarity with the people of France” and provide them with a means of offering their support. He commented: “When the people of Mid and East Antrim Borough sign the books of condolence that means we will then be able to offer their heartfelt sympathies to those bereaved and injured due to the terrorist attacks in Paris on Friday, November 13. 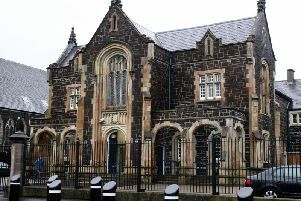 The books are available in Smiley Buildings, Larne; Carrickfergus Town Hall and The Braid Town Hall, Ballymena. A minute’s silence was also held at a meeting of the council’s Economic Growth and Development committee in Smiley Buildings on November 16.